ClearanceJobs has the largest database of cleared professionals in the country. But more than the size of our database, it’s the quality of talent that keeps recruiters coming back year after year. Our database is constantly growing with fresh and unique talent. ClearanceJobs averages over 7,000 new candidate registrations each month. And 40% of our candidates are referrals, resulting in a highly unique database. Plus, ClearanceJobs enjoys a high search engine ranking and is known as a thought leader in the security clearance industry, with a robust news and social media presence. A successful recruiting strategy requires the highest quality candidates. If you require security-cleared professionals, the challenge intensifies. ClearanceJobs connects you only with candidates with active federal clearance, and also those who are career-minded. Talented. Our candidates boast a wide range of skills in technology, engineering, security, aerospace, cybersecurity, finance, intelligence and business. Passive. 85% of our candidates are currently employed and highly coveted. Where do our candidates come from? Jobs posted on ClearanceJobs are broadcast to a wide network of job aggregators, social networks, defense and military sites, and ClearanceJobs partners. We’re everywhere, so you don’t have to be. ClearanceJobs has a significant online presence. When candidates search for security-cleared jobs or topics on Google, Yahoo or Bing, our site is at the top of natural search results. We take advantage of traditional and non-traditional marketing efforts to expand our brand and promote our company. Whether it’s a YouTube segment, a billboard campaign in the D.C. Metrorail system or even a booth at the Army Ten-Miler, we make it easy for defense candidates to find us. 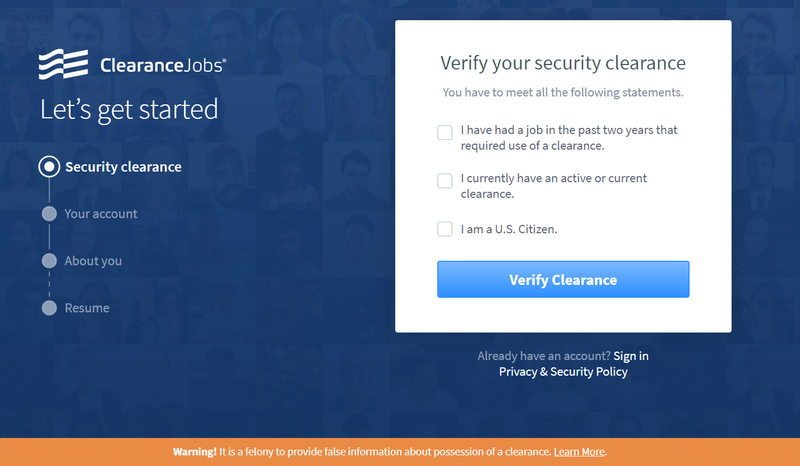 ClearanceJobs is restricted to U.S. citizens with active or current security clearance. - Self verify security clearance status before registration. - Digitally sign statement affirming security clearance status after registration. In addition to the requirements listed above, candidate resumes are automatically removed daily due to candidate inactivity on the site.